*How far along? 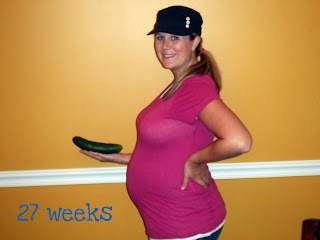 : 27 weeks...hello 3rd trimester!! *How big is your baby? : cucumber...measuring about 15 inches now from head to toe & weighs about 2.2lbs! *Maternity clothes: yes indeed. I miss my old clothes! *What I'm looking forward to: our shower in Georgia this coming Saturday!! Could that hat BE any cuter? You are glowing! I know it's cliche, but it is so true! Your bump is getting cuter by the day! I registered today! 6 settings gourmet and 6 in buffet. They didn't have the other setting in store, but it is called linen closet. I don't know it that's the one you have, but since I couldn't see it today I decided against it. I am going to have to check it out online.